CCMenu displays the build status of projects on a continuous integration server as an item in the Mac's menu bar. It started as part of the CruiseControl project that built the first continuous integration server. CCMenu works with all servers that can provide a feed in the “cctray” XML format. This includes CruiseControl, CircleCI, GreenhouseCI, Jenkins, Snap CI, TeamCity, gocd, and Travis CI. A updated list is available here. Clicking on a project in the menu opens the project's web page in the default web browser. Depending on the continuous integration server this can be a project overview page, or a page with details about the last build. Please note: CCMenu will simply open the link given to it by the server. Problems like the “wrong” page opening, port missing, or incorrect URL scheme, all must be fixed on the server. Previous build was successful and current build finished sucessfully, too. Previous build was successful but current build failed. Previous build was broken and current build failed, too. Previous build was broken, current build finished successfully. A new build is starting on the server. 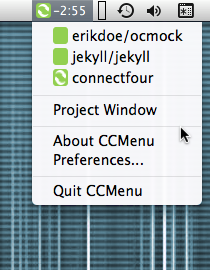 Older versions of CCMenu, for OS X Lion and earlier, use Growl to send notifications. The project window shows more detailed information about each of the projects, including last build time and build label. Note that you can rearrange the columns and sort the view by clicking on the column. These setting and the window size and position are persisted accross sessions. To add a new project, click on the plus icon below the project list in the preferences panel. In the sheet that opens type the URL of the server into the text field or select an existing server from the drop down list. You can enter just the hostname or parts of the URL and CCMenu will then try various common locations for the CCTray feed. If your server has a custom configuration you may have to enter the full URL for the feed. You can drag the projects in the list to arrange the order in which they are displayed. Alternatively you can choose to have the projects sorted alphabetically or by last build time. Note, that the preference to sort the projects only affects the menu, not the project list in preferences. The preferences window is resizable when the project list is shown. CCMenu registers two custom URL schemes. This makes it possible to create links on webpages that, when clicked, will open CCMenu and show a prefilled list of projects to add. It is not possible (yet) to create links that add a project directly. CCMenu stores its configuration using the macOS defaults system, which can be accessed using the defaults command. It is possible to load an initial configuration with a command like the following. CCMenu should not be running when the command is issued. With more command line processing it is obviously also possible to read the existing list, add a new project, and then write the updated list. Last but not least, the open command can be used to trigger the addition of projects from the command line, e.g. 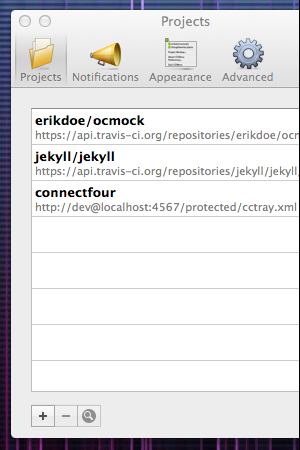 As mentioned above, it is not (yet) possible to create links that silently add a single project. 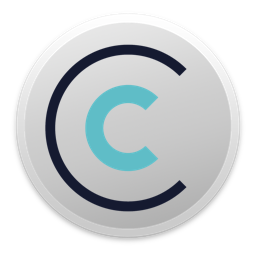 CCMenu is available on the Mac App Store. Old versions of CCMenu (CCMenu 1.8 and older) can be downloaded from the file archive on SourceForge, where the project was hosted until 2014. Newer versions and pre-releases are available on the Github releases page. These versions do not update automatically and you will not be notified when new versions become available. Unless you have a specific reason please install CCMenu from the App Store. Send bug fixes and changes as pull requests on Github. You can also suggest enhancements. Read Martin Fowler's article on Continuous Integration. Find out more at the ThoughtWorks Continuous Delivery insights channel. Copyright © 2007-2017 ThoughtWorks Inc. CCMenu is open source software. See LICENSE for details.